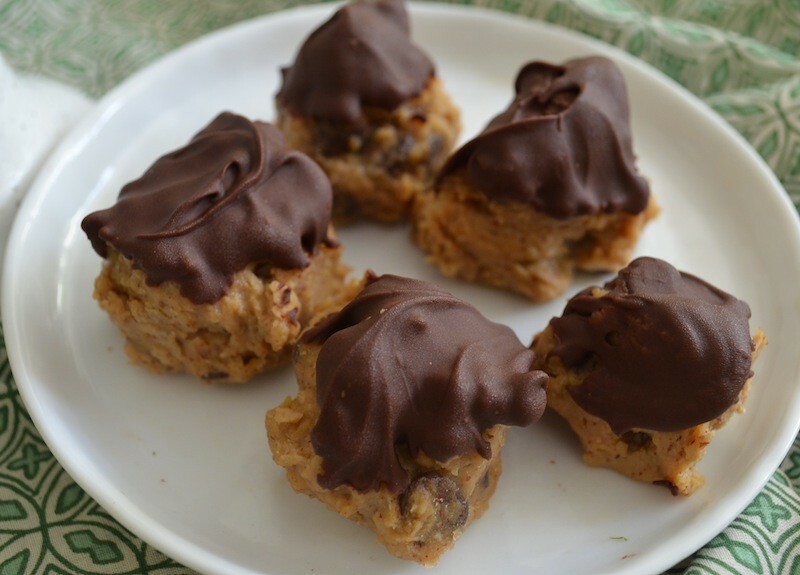 Delicious and healthy vegan and gluten-free chocolate-dipped cookie dough bites? Yes, they exist. And they have a protein-packed secret ingredient as their base: chickpeas. In addition to being a great vegan protein source, chickpeas offer tons of fiber as well as manganese, antioxidant phytonutrients, and folate. How many desserts or snacks can claim that? 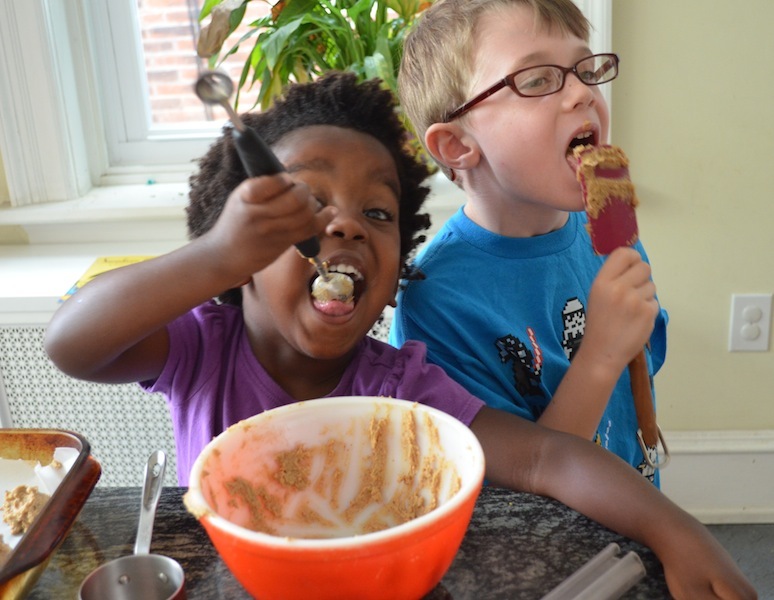 We love bite-sized desserts at our house -- our kids feel like they are getting a treat, and we feel good knowing they aren't consuming a giant white flour and sugar bomb. This chocolate chip cookie dough recipe uses maple syrup and coconut sugar, offering a smoother, less refined (and much less dramatic) sugar high. Still, these little babies are a sweet treat that will fool anyone -- there's absolutely no "bean-y" taste to them. 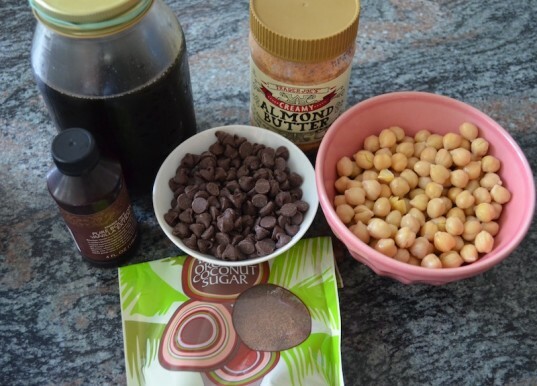 I had come across several bean-based desserts and dips in the past, but I had never given anything with chickpeas a try until I came across this recipe. 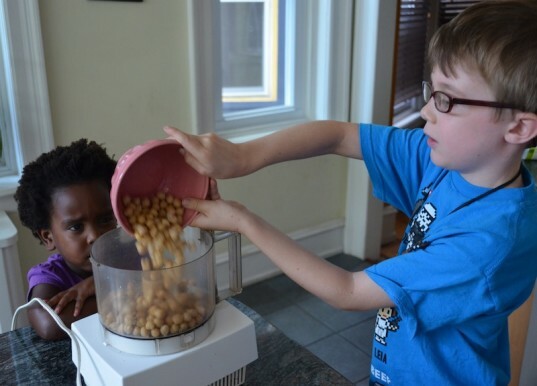 My older son was a little skeptical when he saw the ingredients, but he was quickly won over by the taste: he and my daughter happily licked the "batter" bowl. The chocolate topping didn't hurt either. If you want to make your cookie dough bites like truffles, melt another 1/3 - 1/2 cup of chocolate in step 6. But be warned if your kids are helping -- there will be chocolate everywhere. We chose to dip them instead because my kids could still participate and not need a hose down afterwards. Keep these gems in the freezer for a cold treat on a hot day, or you can store them in the fridge and grab one for a softer, more traditional cookie dough munchie. 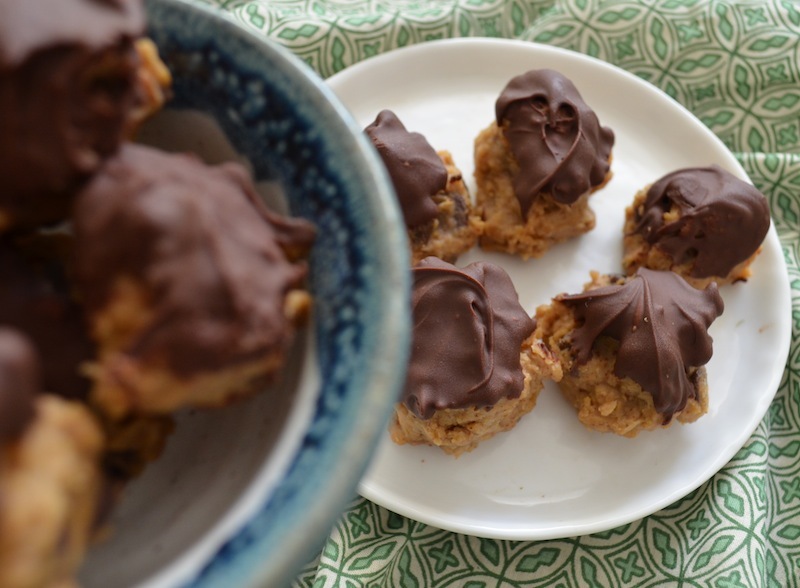 Read on for a great snack or dessert that you can feel good about giving your little ones. In a food processor, add the chickpeas, baking soda, nut butter, maple syrup, coconut sugar, and vanilla extract. Blend until the consistency is smooth and creamy, making sure that all chickpea bits have been well-processed. Scoop the dough from the food processor into a bowl. 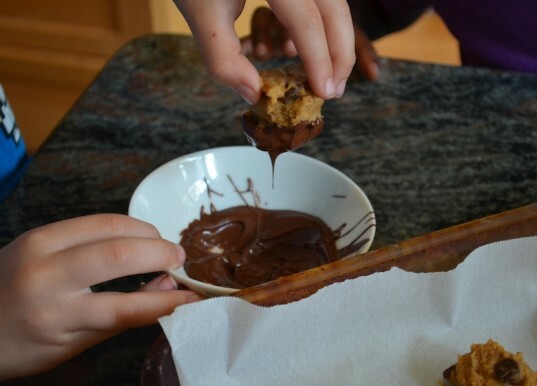 Fold in 1/2 cup of chocolate chips and stir to combine. 4. Scoop out cookie dough bites. 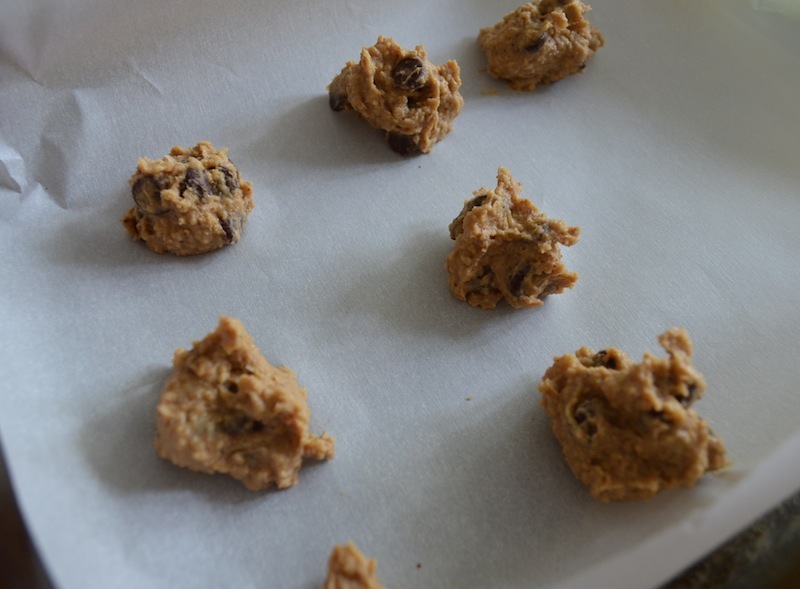 Using a small scooper such as a melon baller or rounded tablespoon measure, scoop out balls of cookie dough into a large, shallow parchment paper covered container. To make perfectly round balls, I would suggest putting the dough in the fridge or freezer for 10-15 minutes to firm up. We chose to scoop ours right away so they are blob-like (but still delicious). This recipe made about 16 cookie dough bites. Freeze the bites in the container (put on a lid or cover with plastic wrap) for about an hour, until firm. 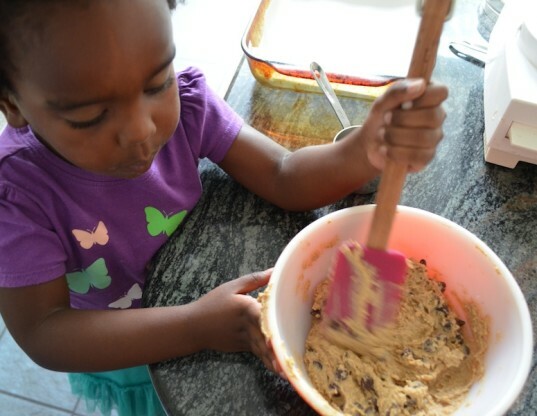 Let your little ones lick the batter bowl — a total bonus since there is no worry of salmonella like in regular cookie dough! 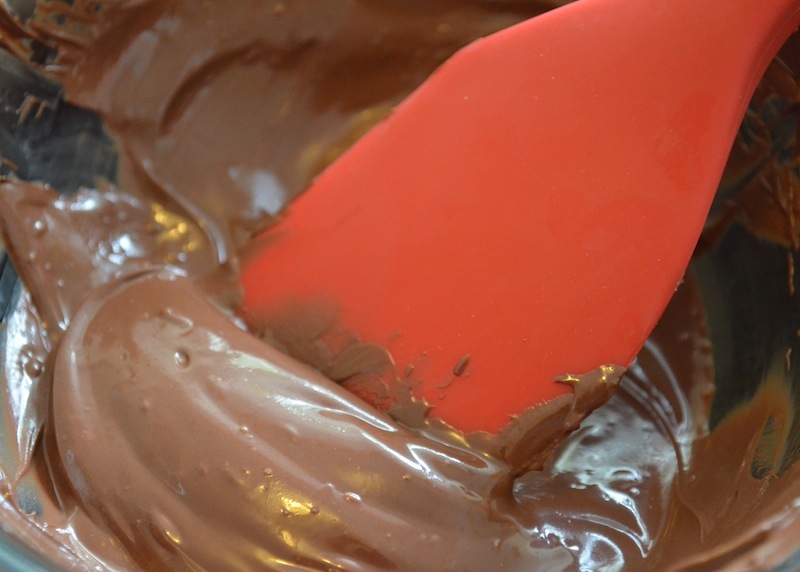 In a double boiler, melt the remaining chocolate chips until smooth and creamy. Remove from the heat. My kids wanted to do the dipping so I transferred some of the melted chocolate into a smaller bowl so that they wouldn’t accidentally touch the hot glass bowl. 7. Dip the cookie dough bites. Take the frozen cookie dough bites from the freezer and dip into the chocolate. Gently shake any excess chocolate from the bite and place on the parchment paper again. The heat from the melted chocolate will cause the bites to soften, so return them to the freezer for about another 1-2 hours until chilled and hardened. Serve from the freezer (let sit at room temperature for about 5-10 minutes before serving) or store them in an airtight container in the fridge. Enjoy! RELATED | HOW TO: Make a Decadent Chocolate Cake That’s Made from Vegetables! Freeze the bites in the container (put on a lid or cover with plastic wrap) for about an hour, until firm. 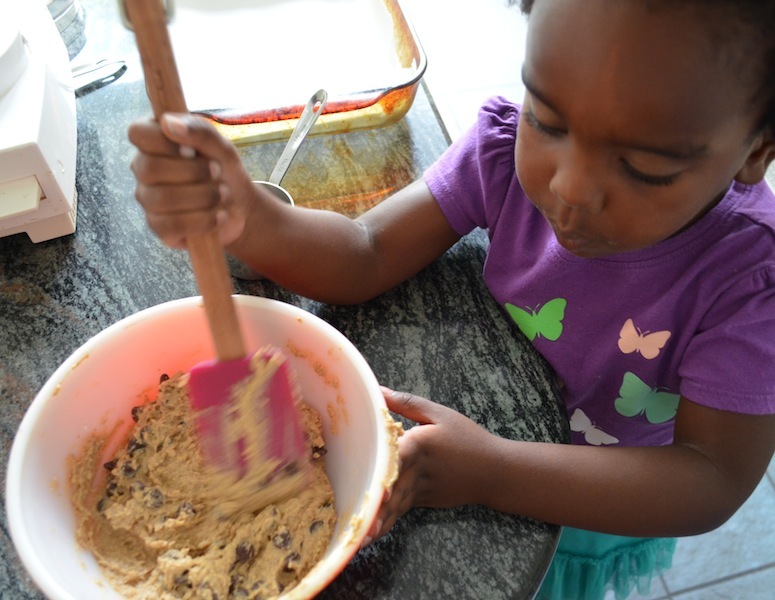 Let your little ones lick the batter bowl -- a total bonus since there is no worry of salmonella like in regular cookie dough! In a double boiler, melt the remaining chocolate chips until smooth and creamy. Remove from the heat. My kids wanted to do the dipping so I transferred some of the melted chocolate into a smaller bowl so that they wouldn't accidentally touch the hot glass bowl. The heat from the melted chocolate will cause the bites to soften so return them to the freezer for about another 1-2 hours until chilled and hardened. Serve from the freezer (let sit at room temperature for about 5-10 minutes before serving) or store them in an airtight container in the fridge. Enjoy!